206 pages | 37 B/W Illus. Three decades of rapid industrialization until the lifting of martial law in 1987, with little or no concern for the environment, have made Taiwan’s environmental degradation a serious problem. In the past twenty years, Taiwan has seen a surge of environmental organizations, which to a certain degree have enjoyed a remarkable success in fighting polluting industries or affecting policies on behalf of the environment. 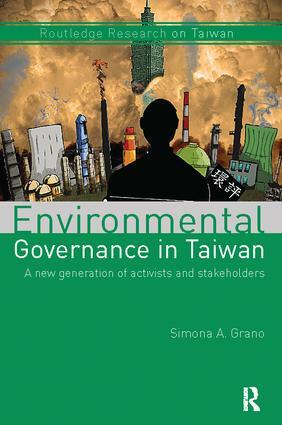 This book aims to analyse environmental governance mechanisms and actors in Taiwan through a multi-disciplinary research approach. Based on extensive and original research, it includes four different case studies, which have all taken place since 2011. It focuses on four major elements of governance - specifically norms, actors, processes, and outcomes - to examine Taiwan’s national and local environmental governance in the post-2008 period. The book shows how the painful lessons Taiwan has learned throughout its transition should be of interest to other developing countries, illustrating how these positive transformations have managed to bring about a more ecologically friendly mode of economic development. Demonstrating that the battle to further ecological sustainability is also a battle to further democratisation, this book will be of interest to students and scholars of Taiwan Studies, Developmental Studies and Environmental Studies. Simona A. Grano is Senior Lecturer at the Department of Sinology at the University of Zürich, Switzerland. Her research interests focus on environmental management and politics, state-society relations, and judicial sector reforms.